The planning is the first stage in a wifi network installation, where in a theoretical way, the locations of the access points as well as the conditions and constructive elements of the area where the wireless infrastructure is going to be deployed are approached. In an ideal scenario the location and materials would not affect WiFi coverage, but this is not the case in reality. For this reason the task of planning and designing a wireless LAN infrastructure is important because it will help us define the location of access points and the amount needed to cover the entire area with a coverage that ensures its proper functioning. Next we can see an image of how it would be the placement of the access points in an ideal case without attenuations of any kind due to walls or other obstacles. Why is it necessary to conduct a planning ? The problem when making a WiFi installation is to determine the location of the access points as well as how many are necessary to cover with guarantees the entire area with a level of coverage and efficiency that ensures the success of the deployment of wireless infrastructure. Streamlines and simplifies the planning and deployment process for installers so they can focus on professionally deploying and validating the network. It is important to identify the materials that make up the facilities in order to adjust the model to reality as reliably and realistically as possible. This is achieved by drawing the walls that make up the area where the WiFi installation is going to be carried out and where the simulation is going to be carried out. On the map we can locate the points of access, as well as orient the direction of emission of the antenna in case of being a directional. Among other parameters you can define the channel and SSID of the network. Once all the walls that affect the propagation of the signal are drawn and the access points are positioned, we will visualize the heat map of the theoretical coverage that these will offer over the area of the plane. When planning the deployment of a WiFi network, the first problem is how to define the location of access points, is a task that experience with years helps but that needs to be verified to ensure that the location is the right one. As we have seen, it is very interesting to have planning tools that allow us to model the environment and construction elements and locate the access points to obtain the most realistic and detailed representation possible of how the WiFi installation will be and thus avoid problems and delays due to a lack of initial planning. How to activate Acrylic WiFi? 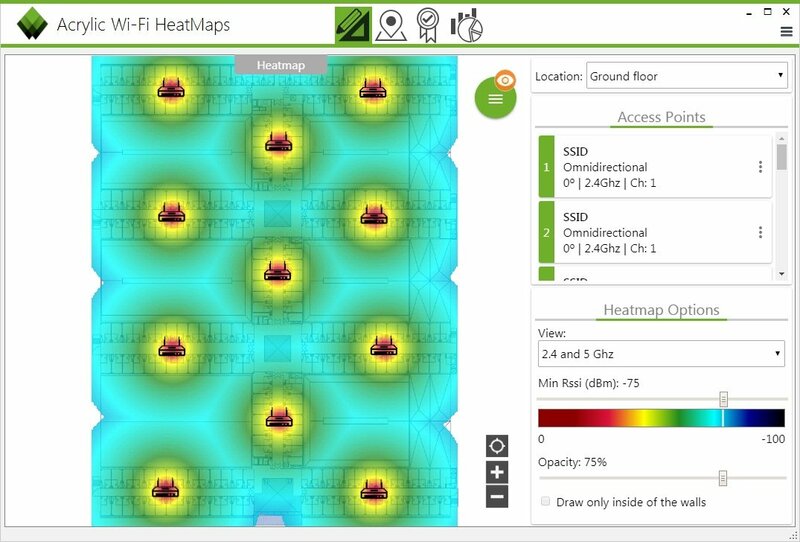 Inicio / Acrylic WiFi heatmaps / WiFi Planning, Design and locate access points in a simulation.